Every day in January I am sharing my best Tips for Better Baking. These are tips that have made my kitchen life easier and helped me become a better baker. Follow along on Facebook or check back here each Sunday for a roundup of the week’s tips. If you’re just joining us, be sure to check out Tips for Better Baking Week One and Tips for Better Baking Week Two. For easy clean up, zest citrus right onto a piece of parchment paper, then easily slide or shake it right into your mixing bowl. The best zest comes from a microplane (pictured below) and I highly recommend investing in one. Every day in January I am sharing one of my best Tips for Better Baking. These are tips that have made my kitchen life easier and helped me become a better baker. Follow along on Facebook or check back here each Sunday for a roundup of the week’s tips. If you’re just joining us, be sure to start here with the Tips for Better Baking – Week One Roundup. All ovens have personalities of their own. Some run hot, some never reach the set temperature, and almost all ovens have hot spots where food cooks and browns quicker. To become a better baker, you’ve got to get friendly with your oven. Buy an external oven thermometer and get to know your oven’s quirks. You will want to adjust your baking accordingly and you may consider getting your oven serviced if the fluctuations are severe. Every day in January I am sharing some of my best Tips for Better Baking. These are tips that have made my kitchen life easier and helped me become a better baker. Follow along on Facebook or check back here each Sunday for a roundup of the week’s tips. 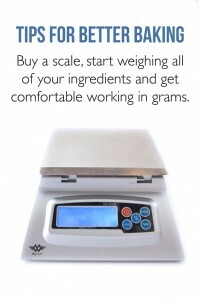 Tips for Better Baking #1 – Use a scale, start weighing your ingredients, and get comfortable working in grams. Using a scale and weighing your ingredients is the number one way to improve your baking. If you’re trying to get 1 cup of flour, the results can vary greatly based on how you fill the measuring cup, but 1 ounce is always 1 ounce and 100 grams is always 100 grams. It’s a much more accurate way of measuring ingredients and once you get comfortable working with a scale, it’s much easier too. I have created a handy Cups to Grams Baking Conversion Chart that includes the most common conversions needed in baking. I recommend printing it out and taping it to the back of your kitchen cupboard doors. Click here to download the chart and a free tutorial on how to use it. I recommend this My Weight Kitchen Scale because it’s easy to use, fast, and lightweight. It’s also really affordable for such high quality. 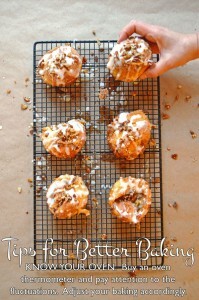 Here’s a way to have the same freshly baked sticky bun experience without all of the work and preparation. A marshmallow is dipped in butter, then cinnamon and sugar, wrapped in crescent roll dough, then dipped in more butter, cinnamon and sugar. The magic happens in the oven when the marshmallow magically disappears, melting with the cinnamon and sugar and creating the gooey sauce that makes a sticky bun so good. Drizzle generously with cream cheese glaze, top with toasted pecans, and you are done. 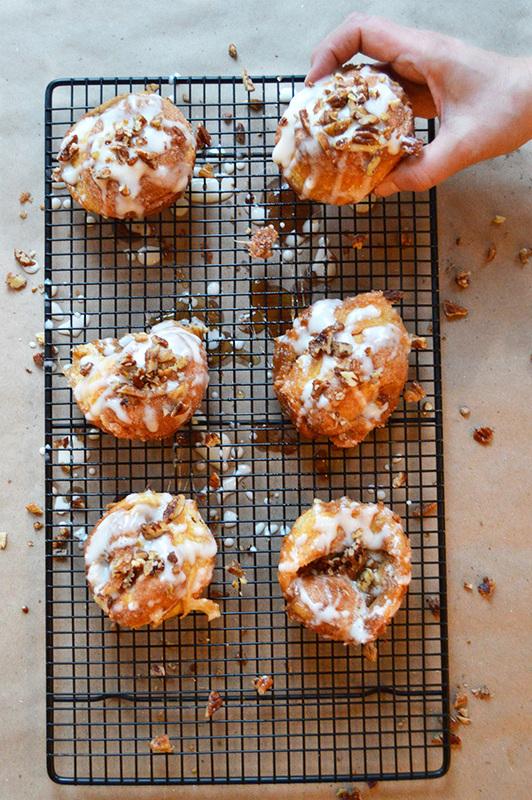 Freshly baked pecan sticky buns in less than an hour and you did not have to wake up early. My mom first remembers making these when she was in the 3rd grade and they would often have them for breakfast on the weekends or for holidays. She had no idea where the recipe came from but after a little research, I found a variation of this recipe won the Pillsbury Bake-Off in 1969 and has remained popular ever since.